What are the benefits of insulating your warehouse? 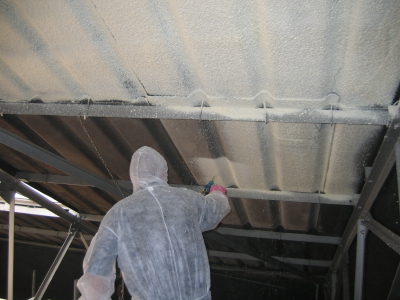 Expanding spray foam is used to great effect in commercial, residential and agricultural barns and warehouses. 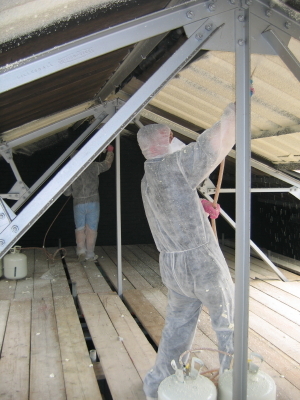 Whether you are repairing and refitting an old warehouse or building a new one, sprayed foam is ideal as it provides seamless, efficient insulation that seals the roof from the inside. The polyurethane sprayed foam can be used on just about any surface of any shape or any slope. It is particularly useful in warehouses as the construction materials tend to be corrugated e.g. 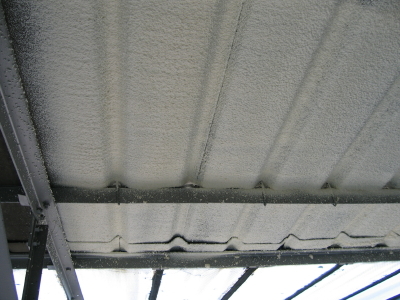 Corrugated asbestos, iron or IBR sheeting. Standard insulation materials are not capable of following the contours of the corrugations, making them difficult to apply and creating air gaps that may lead to condensation problems. They do not provide a good seal against rain or wind either. The foam has the advantage of bonding metal sheets and asbestos sheets together, this is useful for strong winds and oddly enough as an anti-theft measure. People are often worried that applying the sprayed foam sealant is not a job they can do themselves. This is not true, it is not rocket science!! If you can remember to heat up the tanks and change the nozzles frequently, you are capable of spraying foam.... if not, well, we can nag you into remembering. Warehouses are generally larger jobs than domestic applications, but there is no reason to feel daunted by this. Plan ahead and give yourself adequate time to get the spraying done. Always factor in delivery time as well as preparation time and spraying time. Generally speaking you can gauge the time needed for spraying based on the time it takes to empty a large set of tanks: on average 1hr 20 minutes (covering approximately 600 square feet at 1” thick). You will obviously need to add in the amount of people spraying, breaks and preparation, but this means that fairly large areas can be insulated quickly thus reducing scaffold/cherry-picker hire costs. Remember to measure accurately and also remember, corrugations have a larger surface area than a flat surface. Take these into consideration when measuring! The easiest way to do this is to lay twine along the contours of the corrugations and then to stretch the twine out and ascertain what percentage the corrugations have added to the overall measurement. This photo shows spraying completed by two lads with no previous spray foam experience.